Coverjunkie responsibility to the site’s content and its members. posts that relate to products that sexual or pornographic in nature. posts restrict or inhibit any other user from using and enjoying the Svpply sites or the Svpply services offered on them. 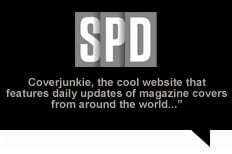 Coverjunkie retains the right to delete any member account without warning for first-time or continued violation of these terms or any other reason. The images made available to you by means of the Coverjunkie service are protected by the copyright and trademark laws of the netherlands and other countries. Before using images for any purpose other than viewing on the web, you may need to obtain the authorization of the owner of the materials . It is your responsibility to obtain any authorizations to use an image or text that may be required; Coverjunkie cannot give you such authorization. We cannot guarantee that Coverjunkie will not locate unintended or objectionable content and Coverjunkie accepts no responsibility or liability for the content of any images or text included in any Coverjunkie list or otherwise linked to by the Coverjunkie services, or for your use of such content. In no event shall Coverjunkie be liable to you or any third party for any indirect, consequential, exemplary, incidental, special or punitive damages, including lost profit damages arising from your use of the services, even if Coverjunkie has been advised of the possibility of such damages, notwithstanding anything to the contrary contained herein. You agree to indemnify and hold Coverjunkie, its subsidiaries, and affiliates, and their respective officers, agents, partners and employees, harmless from any loss or liability arising out of your use of the sites or from any claim, or demand, including reasonable attorneys’ fees, made by any third party due to or arising out of your use of the sites in violation of these terms of service and/or any breach of your representations, warranties and obligations set forth above and/or if any content that you post in Postings on the sites or through the sites causes Coverjunkie to be liable to another. Coverjunkie may change this policy from time to time in its discretion. You affirm that you are either more than 13 years of age, or an emancipated minor, or possess legal parental or guardian consent, and are fully able and competent to enter into the terms, conditions, obligations, affirmations, representations, and warranties set forth in these Terms of Service, and to abide by and comply with these Terms of Service. In any case, you affirm that you are over the age of 13, as Coverjunkie is not intended for children under 13.